How can one convey nostalgia? I am no wordsmith and sometimes words escape me, so I try it with my camera lens. A nourishing and delightfully scented, not so sweet but fun kind of treat from my childhood days is murmura laddu. Also known as borugula mudda in Telugu and rice crispies in English. During December and January months (Sankranthi time), when parents are busy with harvesting rice and sugarcane, grand parents prepare these crunchy, homely sweets for children with freshly popped murmura from rice battis and just minted 24 karat quality jaggery. Jaggery syrup is prepared and murmura are added - just these two ingredients and tiny touch of cardamom - that’s it. Magical, irresistible laddus would be ready to keep us children (mouths) busy. I am happy that I am finally able to recreate this Sankranthi magic on Mahanandi. Though recipe looks simple, I know how difficult it is to prepare these kinds of sweets, so I measured and timed the process to make it fail proof and for decent results. Give it a try. To test jaggery syrup readiness - Keep a small plate with cold water ready by stove side. In a big, sturdy, thick-bottomed vessel, add water and jaggery. Cook on medium-high heat. Jaggery melts and begins to concentrate. When it starts foaming like shown in the photo above, it reached the consistency we want for this recipe. To test, add few drops of jaggery syrup to the cold water. When pushed with fingers, if the syrup can be rolled to a round and keeps share without melting in spite of tilting the plate to different directions, it is done and the syrup is ready. This whole process takes about 15 to 20 minutes. Constantly stirring, add murmura. Also sprinkle in cardamom powder. Within one or two minutes, murmura starts to soak up the syrup and comes together in to dry mass. Turn off the heat. Remove the pot from the stovetop to countertop. Wait for about 5 minutes for murmura-jaggery mixture to cool down and then start making laddus. Take a spoonful of mixture into hands and press gently into round shape. Keep a bowl of cold water on the side. Dip your hands in-between laddu making to keep hands unsticky and cool. Or ladle off the whole mixture into a greased pan. Press firmly and evenly. Cut into squares and let it cool. Break along the lines to separate the pieces. Makes about 12 medium sized laddus or squares. Murmura and Jaggery are available at local Indian grocery shops. Prepare this sweet with fresh, crunchy tasting murmura only, for best results. Buggani, the name itself makes my mouth water. A simple and common dish, prepared with puffed rice or borugulu , it’s traditionally served as breakfast in our Rayalaseema region. My mother makes the best buggani in the whole world, so I follow my mothers recipe exactly to the last words. In Nandyala, my hometown in India, we buy freshly made puffed rice from street vendors. 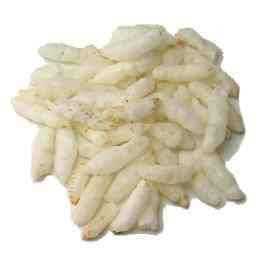 Here in US, in Indian grocery shops, puffed rice is available in only one size i.e. 14 OZ packets. Usually I prepare Buggani with half of that (25o g) packet for us two. Buggani needs hot, spiciness from green chillies. So don’t hesitate to add enough green chillies. First, take a big pot, fill half of it with tap water and add puffed rice to the water. Because of lightweight, they will float. Using your hands push them under water for few seconds. Let them soak water. Exactly after 5 minutes, remove them from water by taking handfuls and firmly squeezing the water from them by pressing the hands together tightly. Remove them all from water in this way and put them in a colander. In a large frying pan over medium heat, heat one tsp of oil and do the popu (frying the mustard seeds, cumin, red chillies and curry leaves in oil). Add onions, sauté them until light brown, then add green chilli paste, sauté it till it turns from bright green to light green colour, don’t brown it. Finally add a pinch of turmeric and salt. Stir them all once and turn off the heat. Add this hot onion mixture immediately to puffed rice along with roasted peanuts and roasted chickpea powder. Mix them all together and add salt if needed. That’s it. Serve them as soon as you prepare them. Just before eating, squeeze few drops of lime. We usually serve this Buggani along with few pieces of finely chopped onions (washed in water beforehand), some more roasted peanuts, and a lemon wedge.